Free Shipping Included! 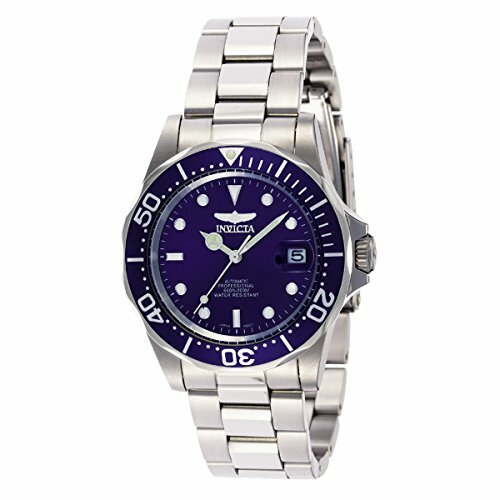 Invicta Men's 9094 Pro Diver Collection Stainless Steel Automatic Dress Watch with Link Bracelet by Invicta at Kerinci. SKU: 9094. MPN: 9094. Hurry! Limited time offer. Offer valid only while supplies last. Blue-dial watch featuring numbered unidirectional bezel, magnified date window at 3 o'clock, and logo-accented, 40 mm stainless steel case with mineral dial window. Unscrew the crown, then pull it out to activate. And the reverse applies after setting the date and time.